Intensive burning of fossil fuels and deforestation over the last two centuries have increased CO2 levels in the atmosphere by almost 40 percent. The oceans have absorbed about one-third of all human-generated carbon emissions, but the buildup of CO2 in the ocean is pushing surface waters toward more acidic conditions. This “ocean acidification” creates a corrosive environment for marine organisms such as corals, marine plankton, and shellfish that build carbonate shells or skeletons. Mollusks — including mussels and oysters, which support valuable marine fisheries — are particularly sensitive to these changes. In a case study of U.S. commercial fishery revenues published in the June issue of Environmental Research Letters, WHOI scientists Sarah Cooley and Scott Doney calculated the possible economic effects of ocean acidification over the next 50 years using atmospheric CO2 trajectories from the Intergovernmental Panel on Climate Change and laboratory studies of acidification’s effects on shell-forming marine organisms, focusing especially on mollusks. Mollusk sales by fishermen currently generate about $750 million per year — nearly 20 percent of total U.S. fisheries revenue. The study assumed that mollusks harvests in the U.S. would drop 10 to 25 percent in 50 years’ time as a result of increasing acidity levels, which would decrease these mollusk sales by $75 to $187 million dollars annually. 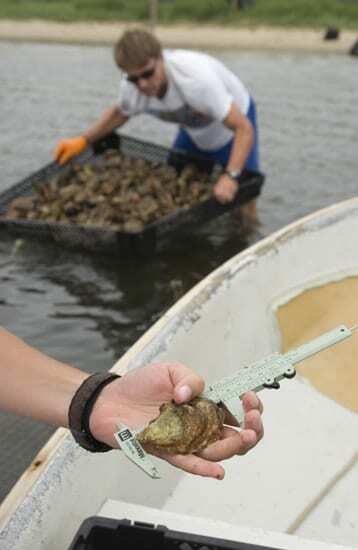 “Losses in primary revenue from commercial mollusk harvests—or the money that fisherman receive for their catch—could add up to as much as $1.4 billion by 2060,” said Cooley. Reduced harvests of mollusks, as well as losses of predatory fish and other species that depend on mollusks for food, could lead to economic hardships for fishing communities. Because changes in seawater chemistry are already apparent and will grow over the next few decades, Cooley and Doney suggest measures that focus on adaptation to future CO2 increases to lessen the impact on marine ecosystems, such as flexible fishery management plans and support for fishing communities. This research was supported by grants from the National Science Foundation and Woods Hole Oceanographic Institution. The Woods Hole Oceanographic Institution is a private, independent organization in Falmouth, Mass., dedicated to marine research, engineering, and higher education. Established in 1930 on a recommendation from the National Academy of Sciences, its primary mission is to understand the oceans and their interaction with the Earth as a whole, and to communicate a basic understanding of the ocean’s role in the changing global environment. How Long Can the Ocean Slow Global Warming? How much excess carbon dioxide can the ocean hold and how will it affect marine life?